Makes the transition from PEX to Copper Simple! 104-22 1/2" x 1/2" Sweat, full port. Not for potable systems. 104-24 1" x 1" Sweat, full port. Not for potable systems. 105-22 1/2" x 1/2" Sweat, full port with drain. Not for potable systems. 105-24 1" x 1" Sweat, full port with drain. Not for potable systems. 640XB01 3/8" PEX Plug. Not for potable systems. 640XB03 3/4" PEX Plug. Not for potable systems. 640XB04 1" PEX Plug. Not for potable systems. 641XB334 3/4" x 3/4" x 1" (end, end, middle). Not for potable systems. 641XB433 1" x 3/4" x 3/4" (end, end, middle). Not for potable systems. 632X221M Elbow 1/2" PEX x 3/8" MIP. Not for potable systems. 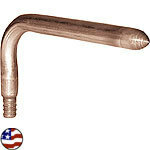 638XT263 1/2" Stub Out Elbow 3" X 6"